All of our guests that have come for pizza have been special guests. But this weeks guests came all the way from Down Under! My Aunt Bev and Uncle Oak are visiting from Australia. They are staying with my parents and I was really looking forward to having them over for pizza. As much as they hate to admit it, Oak and my step-dad Jimmy are like twins. They both love golf, they both love scotch and they both love meat. In planning for their visit I created a new meat lovers pizza recipe: The Heart Attack! Jim had clearly been disappointed with the lack of spice on the Chorizo pizza I made for him, so tonight I pulled out the big guns. This pizza recipe calls for three meats we had tried before; pepperoni, hot Italian sausage and hot Capicola. And because I love the men in my life, I added Kalamata olives in an attempt to slow their heart attacks. I spread these ingredients atop marinara sauce and mozzarella cheese. This pizza was fantastic! 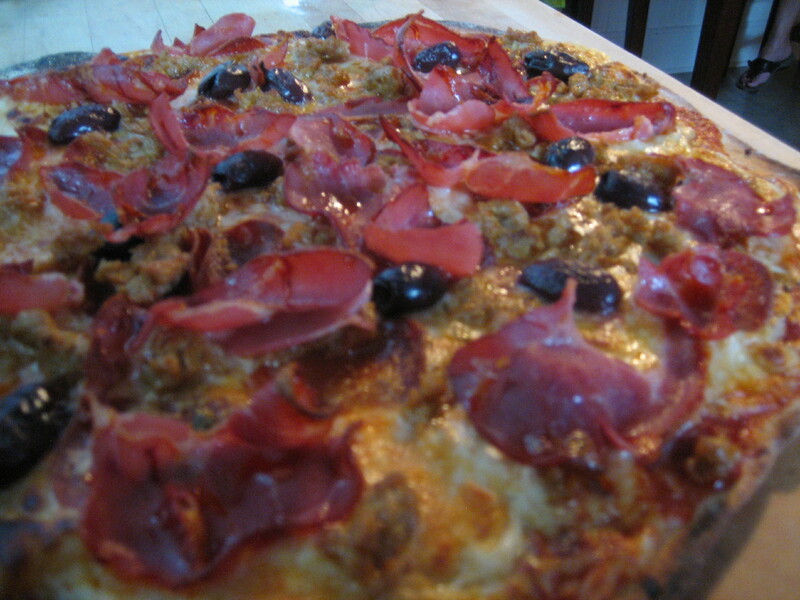 Capicola is such a great topping on pizza and it goes so well with the olives. And luckily there were no heart attacks at dinner, just full bellies. Tonight Andrew is doing the final planning for Imagine RIT: Innovation and Creativity Festival which will be held at Rochester Institute of Technology, Saturday May 1 from 10:00am-5:00pm. As he and several of his right-hand men/women are getting prepped for tomorrow, I was inspired create an Imagine RIT pizza recipe. 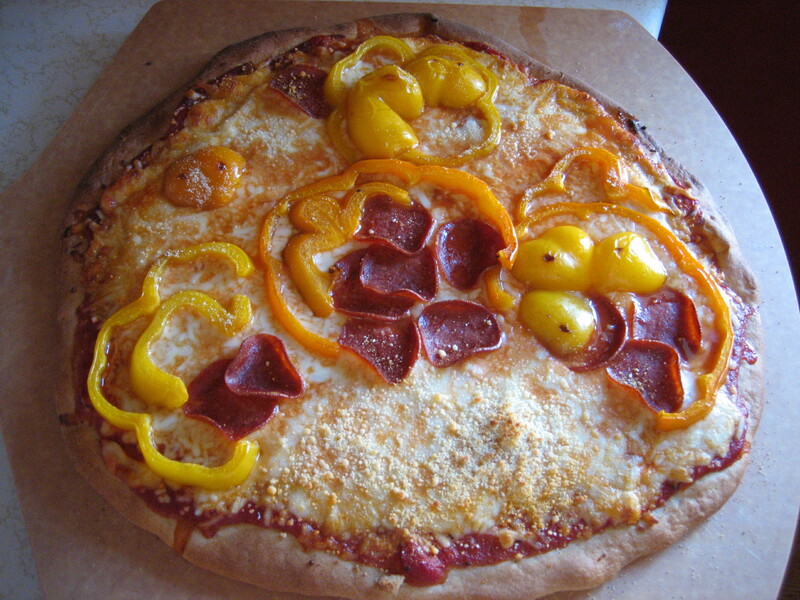 To represent the colors of the Imagine RIT logo I used white mozzarella cheese, yellow and orange peppers sliced in roundish pieces, and red pepperoni. I then attempted to lay out the toppings in a similar fashion as the logo. This was slightly challenging due to the shape and texture of the toppings, but I think it looks pretty good compared to the image. I’m sure that Andrew and his comrades are in need of a delicious dinner break so I’m off to deliver this Imagine RIT pizza to campus. I hope to see you at the festival! We decided to have some friends over for pizza and other snacks. The next three pizzas were made for that night. I figured I should make the old stand-by, marinara and cheese. It turned out to be a hit. This is a pizza I have made for Andrew and I before so I knew it would be great. I used poultry Italian sausage, turkey pepperoni, sautéed onions, marinara and mozzarella cheese. I was right, it was great. One of our friends is lactose intolerant, I can’t even imagine because I love cheese so much. I have seen him eat cheese before but I wanted to check with him to see what he could eat. He said melted cheese was the worst, I pity him so much because I love melted cheese the best! I was kind of excited for the challenge of a cheese-less pizza, I have never attempted it before due to my cheese addiction. I roasted red peppers, something I learned to do earlier in the week. I also roasted some onions and sautéed zucchini. I brushed Wegmans basting oil with garlic and herbs on the crust and added the veggies. This pizza turned out to taste great and our lactose intolerant friend was grateful and satisfied with my creation. I was disappointed that the veggies did not stay on the pizza after I sliced it and they fell off when you tried to eat it. The challenge is how do you get the veggies to stay on the pizza without cheese? I will attempt that challenge again sometime.